Hurricane Sandy Gave Navigation, News, Finance Apps A Massive Boost… But Not Weather? Use of weather apps actually decreased during Hurricane Sandy. When Hurricane Sandy left millions of people across the East Coast of the United States without electricity, portable, battery-powered devices like smartphones and tablets were all they had to rely on. Not only did they provide a means of entertainment, but they also allowed those affected by the storm to follow the latest news and weather information. With that being the case, Sandy had some interesting effects on app statistics. Compared with the preceding week in New York City, use of navigation apps more than doubled, while those in the finance category saw a 74% boost. Photography and news apps also became more popular, while, surprisingly, weather apps remained closed. According to mobile ad network Velti, the use of navigation apps was up by a whopping 104% while Hurricane Sandy was at large, presumably because people were using their smartphones to find new routes in an effort to avoid the storm. This also explains the 48% increase in usage in travel apps. 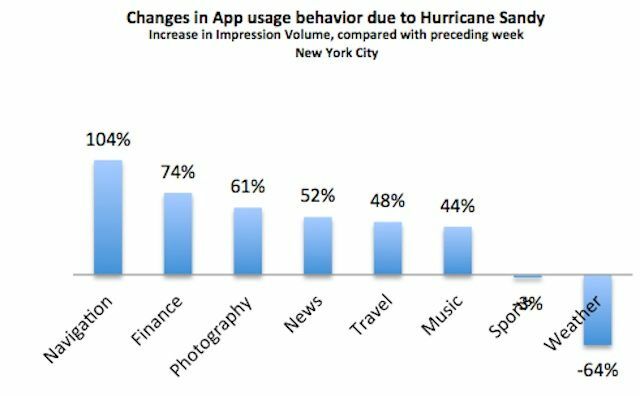 Apps in the photography category saw 61% more usage as people documented the events of the hurricane, while those in news saw 52% more usage. Music apps were a big source of entertainment, with a 44% boost in usage, while gaming was up just 19%. Surprisingly, the use of weather apps actually decreased by 64%. That’s likely to be because users didn’t need their smartphone to tell them what the weather was like, or because they got all the information they needed from news sites.